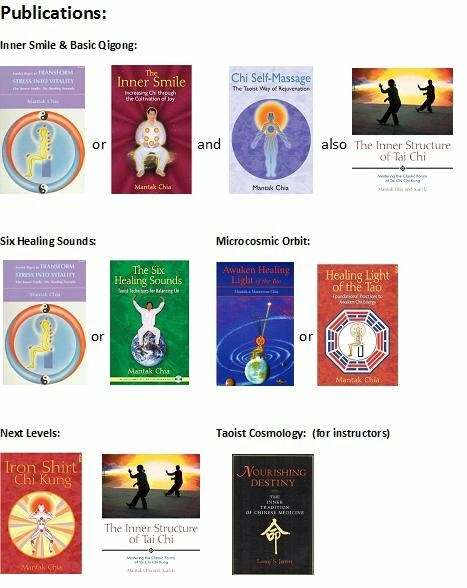 Over the years Mantak Chia and senior instructors of the Universal Healing Tao have co-published many incarnations of the same material. Master Chia likes to refine, separate and upgrade Qigong practices. Older books are valuable; actually closer to what is taught by most senior level instructors. Books and Videos best supplement your live education. It’s important to mention that students shouldn't jump ahead to higher levels without a firm practice in the Inner Smile & Microcosmic Orbit; the strongest trees are the ones that are flexible and have the deepest roots. Essential foundations are Inner Smile, Six Healing Sounds, and Microcosmic Orbit. Continuing area's are Iron Shirt, Tai Chi Chi Kung, Fusion of the Five Elements and Healing Love.